Carib, Island Carib, or Kalinago people, after whom the Caribbean Sea was named, live in the Lesser Antilles islands. They are one of the two main tribes of Amerindian people who inhabited the Caribbean at the time of Christopher Columbus' discovery of the New World, the other being the Taino (also known as the Arawak). 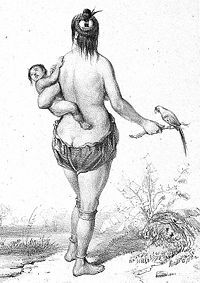 Like most of the indigenous peoples of the New World, the Carib suffered greatly from European Colonization of the Americas European conquest, and their descendants are now scattered throughout the Caribbean and South America, with the largest group living on the island of Dominica where the British established a reservation for them. Often the Carib are remembered for being ferocious warriors and for cannibalistic customs. Although it may be true that they were warlike, fighting and displacing other tribes such as the Taino, they have often been maligned by exaggerated early European propaganda that over-looked their many accomplishments and skills, such as sailing, navigation, and basket weaving. Today, Carib make effort to preserve their culture and educate their children and others about their traditions, maintaining their identity while at the same time being part of the contemporary society. Although the precise time frame remains unknown, it is generally believed that the Taino were the first group to migrate from the Orinoco river area in South America to the islands of the Caribbean, sometime around 500 B.C.E. The Carib followed soon afterward, invading many areas the inhabited by the Taino, killing and subjugating their predecessors. By 1400 C.E., the Carib controlled most of the West Antilles and areas of the cost of Venezuela. After years of hostility, the two tribes settled into a general peace and cooperation, trading amongst each other and in some areas, such as the island now known as Dominica, the two cultures blended together. In 1493, during his second voyage to the New World, Christopher Columbus landed on the island the Carib had named Waitukubuli, which translates as "Tall is her beauty." Columbus renamed the island "Dominica," from the Latin Domingo, which means "Sunday." Columbus' first encounter with the Carib was marked by the natives' hostility towards the Europeans. Whereas history records Columbus was welcomed and made quick connections with the Tainos he encountered, Columbus and the Carib were almost immediately at odds with one another. After a few small but fierce skirmishes, Columbus and his men withdrew from the island of Dominica. Columbus named these natives Caniba, after the land other tribes referred to as Caritaba, where fierce cannibal warriors lived. Eventually the Caribs warmed to the Europeans and trade developed. However, further European conquest soon proved the disastrous for the them. The 1635 invasion and seizure by the French military of the island of Martinique, which lies southeast of Dominica and was also populated by Caribs, made it part of the French colonial empire. Using their overwhelming military superiority, the French forces of Pierre Belain d'Esnambuc subjugated the indigenous Carib peoples to French colonial rule. Through Cardinal Richelieu, France gave the island to the Company of the American Islands (Compagnie des Isles d'Amerique). French Law was imposed on the conquered inhabitants and the Jesuits arrived to convert them to the Roman Catholic Church. When the Caribs could not be sufficiently induced to supply labor for building and maintaining the sugar and cocoa plantations the Company desired, in 1636 King Louis XIII authorized the abduction of slaves from Africa for transportation to Martinique and other parts of the French West Indies. The Caribs revolted against French rule and under Governor Charles Houel sieur de Petit Pré the "Carib Expulsion" was launched against them in 1660. Many were slaughtered; those who survived were taken captive and expelled from the island, never to return. By the eighteenth century the British Empire had moved in and begun to threaten the French and Spanish colonies. In 1763 the British captured the island of Dominica and forced the Carib onto a reserve of 232 acres (94 ha), while the British took control of the rest of the island and consumed its natural wealth and resources. The Carib on Dominica, although confined to a small part of the island, fared better than other tribes on other islands. In 1796, the British Empire took control of large parts of the Caribbean. The population of Saint Vincent, known as the "Black Carib" because a slave ship had wrecked on the island in the seventeenth century and surviving African slaves had intermarried with the Carib Indians, were relocated to an island off the coast of Honduras where they suffered from disease and maltreatment. However, enough were able to make it off the island and survive in small numbers in Central America. Across the rest of the Caribbean, the Carib and other indigenous tribes were decimated in numbers by the European suppression, disease, and the Inquisition. By the beginning of the twentieth century, the Carib existed primarily on the reserve in Dominica with a few groups scattered in Central America. Carib woman in traditional dress, typically cotton pants. Much of the historical narrative of the Carib culture has focused upon their aggressive and war-like characteristics. The Taino's experiences of fighting and being conquered by the Carib influenced Columbus' account of the Carib tribes. In fact, it was Columbus' second hand knowledge and limited personal contact with the Carib that led to the creation of the word cannibal. The English word "cannibal" originated from the Carib word karibna ("person"), as recorded by Columbus as a name for the Caribs. The existence of cannibalism has been challenged by some anthropologists as well as contemporary Carib. However, there is significant historic evidence that instances of cannibalism were spiritual acts connected to deeply held war rituals; purportedly, male warriors would eat small amounts of the flesh of their enemies so as to assume their characteristics. This ritual eating of human flesh took place before a raiding expedition or during initiation, when it was hoped young men would inherit the bravery of a distinguished warrior. More commonly though, the Carib would collect the limbs of victims as trophies, and had a tradition of keeping the bones of their ancestors in their houses. The belief that the physical remains of the dead could be used to harvest some residual power of the living was central to Carib spirituality. Caraib indians, one of them wearing a tattoo. P. J. Benoît, 1839. 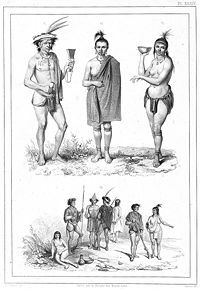 Because of a possible shared ancestry and years of assimilation, the Caribs shared many cultural similarities with the Tainos. Both are generally thought to have been polytheists, who believed in nature spirits and practiced forms of shamanism. The Carib believed in an evil spirit called Maybouya who had to be placated in order to avoid harm. The chief function of their shamans was to heal the sick with herbs and to cast spells which would keep Maybouya at bay. The shamans underwent special training instead of becoming warriors. As they were held to be the only people who could avert evil, they were treated with great respect. Their ceremonies were accompanied with sacrifices. As with the Taino, tobacco played a large part in these religious rites. The fact they were able to migrate from the continent to various islands in the Caribbean, as well as conquer already populated islands are testaments both to their skills as navigators and boat builders. The Carib were also skilled at basket weaving and pottery. The tribes subsisted on fishing and small scale farming. The social structure of Carib tribes were mostly patriarchal. The men trained as warriors, traveling by canoe on raiding parties. Women primarily carried out domestic duties and farming, and often lived in separate houses from the men. However, women were highly revered and held substantial socio-political power. The Caribs usually lived in small groups, but these groups were often not exclusive from one another. After successfully conquering parts of the Caribbean, the Carib language quickly died out while the Arawakan language was maintained over the generations. This was the result of the invading Carib men usually killing the local men of the islands they conquered and taking Arawak wives who then passed on their own language to the children. For a time, Arawak was spoken primarily or exclusively by women and children, while adult men spoke Carib. Eventually, as the first generation of Carib-Arawak children reached adulthood, the more familiar Arawak became the only language used in the small island societies. This language was called Island Carib, even though it is not part of the Carib linguistic family. It is now extinct, but was spoken on the Lesser Antilles until the 1920s (primarily in Dominica, Saint Vincent, and Trinidad). 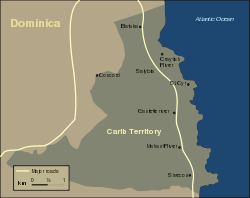 Map of Carib Territory on the Island of Dominica. Today, small pockets of ethnic Carib communities are scattered throughout the Caribbean and South America, in such places as Trinidad, Venezuela, Colombia, Brazil, French Guiana, Guyana and Suriname. The largest community lives on the island of Dominica, in the original reservation established for the Carib by the British in the eighteenth century. An estimated community of 3,400 people live in this reservation. This community elects their own Chiefs who serve for four years at a time, and officials who represent the Carib in the Dominica government. 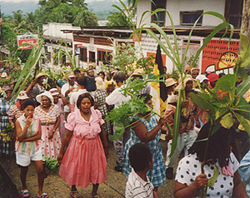 These communities have made efforts to keep their historical traditions and culture alive, partially for preservation but also for economic reasons, as the Carib territories are marketed as tourist attractions where visitors can view cultural acts such as dance as well as purchase authentic crafts and artwork. The Carib community has established the Karifuna Cultural Group which works to preserve their culture and to support education about Carib history and tradition. Garinagu at the San Isidro Labrador street celebration in Livingston (Guatemala). The Santa Rosa Carib Community (SRCC) is the major organization of indigenous people in Trinidad and Tobago. 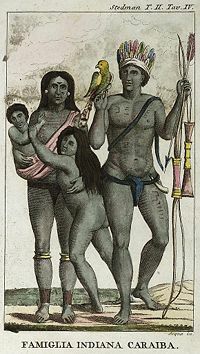 The Caribs of Arima are descended from the original Amerindian inhabitants of Trinidad; Amerindians from the former encomiendas of Tacarigua and Arauca (Arouca) were resettled to Arima between 1784 and 1786. The SRCC was incorporated in 1973 to preserve the culture of the Caribs of Arima and maintain their role in the annual Santa Rosa Festival (dedicated to Santa Rosa de Lima, the first Catholic saint canonized in the New World). Today, the Garinagu (singular: Garifuna), descendants of Carib, Arawak, and African people referred to by the British colonial administration as "Black Carib" live primarily in Central America. They live along the Caribbean Coast in Belize, Guatemala, Nicaragua, and Honduras, and on the island of Roatán. There are also diaspora communities of Garinagu in the United States, particularly in Los Angeles, Miami, New York, and other major cities. ↑ 1.0 1.1 1.2 Kevin Menhinick, "The Caribs in Dominica: Karifuna Cultural Group," Caribbean Taino News Service, 1997. Retrieved February 25, 2009. ↑ 2.0 2.1 Jan Rogonzinski, A Brief History of the Caribbean: From the Arawak and Carib to the Present (Plume, 2000, ISBN 0452281938). ↑ 3.0 3.1 Kwabs.com, "Caribbean Indigenous people." Retrieved February 25, 2009. ↑ Prefecture Région Martinique, Martinique' Institutional History, Maryanne Dassonville (trans. ), 2007. Retrieved February 25, 2009. ↑ James L. Sweeney, "Caribs, Maroons, Jacobins, Brigands, and Sugar Barons: The Last Stand of the Black Caribs on St. Vincent," African Diaspora Archaeology Network, March 2007. Retrieved February 25, 2009. ↑ 6.0 6.1 Laurance R. Goldman (ed. ), The Anthropology of Cannibalism (Bergin & Garvey Paperback, 1999, ISBN 0897895975). ↑ Lennox Honychurch, The Dominica Story: A History of the Island (Macmillan Caribbean, 1995, ISBN 0333627768). ↑ 8.0 8.1 Simon Lee, "An Artist of the Floating World," The Caribs of Dominica, 2000. Retrieved February 25, 2009. ↑ 9.0 9.1 Ellen B. Basso, Carib-Speaking Indians: Culture, Society, and Language (Tucson, AZ: University of Arizona Press, 1977, ISBN 0816504938). ↑ 10.0 10.1 A Virtual Dominica, "The Carib Indians." Retrieved February 25, 2009. Allaire, Louis. "The Caribs of the Lesser Antilles." In Samuel M. Wilson, The Indigenous People of the Caribbean. Gainesville, FL: University of Florida Press, 1997. ISBN 0813015316. Basso, Ellen B. Carib-Speaking Indians: Culture, Society, and Language. University of Tucson, AZ: Arizona Press, 1977. ISBN 0816504938. Davis, D., and Goodwin R. C. "Island Carib Origins: Evidence and non-evidence." American Antiquity 55(1) (1990). Eaden, John. The Memoirs of Père Labat, 1693-1705. Frank Cass, 1970. Goldman, Laurance R. (ed.). The Anthropology of Cannibalism. Westport, CT: Bergin & Garvey Paperback, 1999. ISBN 0897895975. Gordon, Raymond G., Jr. (ed.). Ethnologue: Languages of the World, Fifteenth edition. Dallas, TX: SIL International, 2005. Retrieved February 25, 2009. Honeychurch, Lennox. The Dominica Story: A History of the Island. Macmillan Caribbean, 1995. ISBN 0333627768. Rogonzinski, Jan. A Brief History of the Caribbean: From the Arawak and Carib to the Present. New York, NY: Plume, 2000. ISBN 0452281938. Steele, Beverley A. Grenada: A History of its People. Macmillan Education, 2003. ISBN 0333930533.